If you can stand to start thinking about Christmas this early then please read on. If you can’t then just ignore this post or I’ll really annoy you. About this time last year I posted Delia’s brilliant Christmas pudding recipe and in case you missed it here’s the link – A job for a rainy weekend – Christmas pudding. Please note that I’ve amended the post to include figures for making smaller quantities. This year I need one large and one small pudding (3/4 of the recipe) so I rather painfully did the maths (never my strong point). If you’re a glutton for punishment, like me, and are going to make your own Christmas pudding, then it makes sense to make homemade mincemeat at the same time because many of the ingredients are the same. I made my own mincemeat for the first time last year (again from a Delia recipe) and it was fantastic. Once you’ve bought all the ingredients it’s really simple but I would recommend chopping the apple using a mini chopper or food processor as this did take a while by hand. Simply mix all the ingredients, except for the brandy, in a very large mixing bowl. Cover with a cloth and leave for 12 hours. Cover the bowl with foil and place the mincemeat in an oven heated to 110oC for 3 hours. Remove from the oven, leave to cool and then stir in the brandy. Spoon into sterilised jars then place in a cool dark cupboard until needed. I think you could actually use it straight away as I had a sneaky spoonful and it was divine. Delia says she has kept hers for up to 3 years but I know mine won’t last that long because I love it too much. 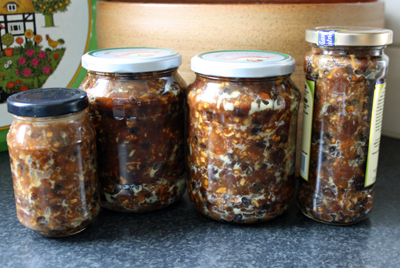 NOTE: For recipes that use mincemeat see my post Christmas is coming – two ways with mincemeat. Last year I also experimented with an apple and mincemeat crumble (I just added a couple of spoonfuls of mincemeat to the cooked apple before adding the topping) and it was very good indeed.